Hey hey hey! Happy Tuesday! This week is already starting to be one of those ‘where did the heck did the week go? !’ weeks. It’s only Tuesday and I feel like time is going by QUICK! I am headed to Colorado tomorrow for a photoshoot with Purely Elizabeth! It’s my second photoshoot with this brand and I’m so excited to get back to Boulder and dream up some amazing content for these ladies. 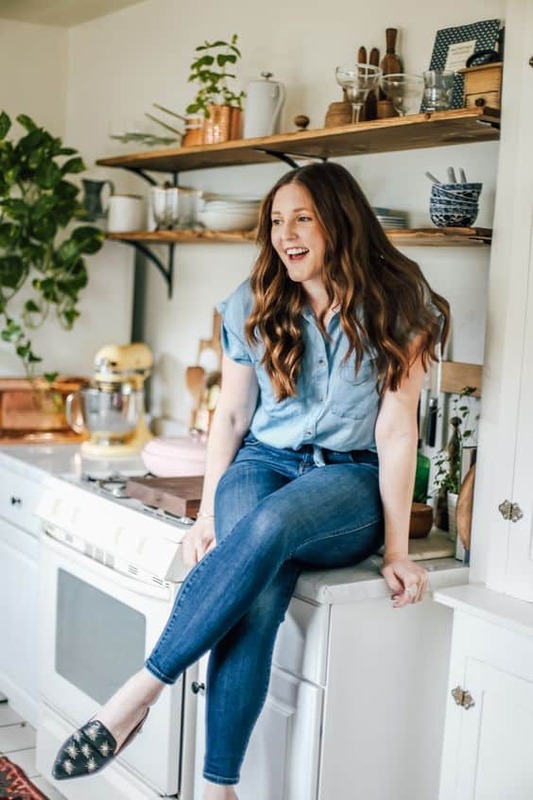 They are launching some really fun new products and need equally amazing pictures to market their dreamy food products! I’ll be doing the shoot on Thursday and Friday and spending some time with my family that lives in the area for the weekend. I’m already missing Jared and Rascal but I suppose I just have to put my big girl pants on. 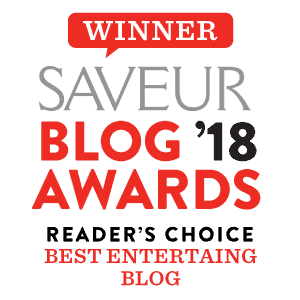 I have become SUCH a homebody this past year. Besides running around looking for lemon zippers, diffusors and reflectors and getting all my camera gear ready, it’s been a nice week! On Sunday I made a big ole batch of white chili bean green veggie enchiladas and I might just have to put these on the blog for you guys! So tasty and perfect for meatless Monday’s or a healthier weeknight dinner. We ate enchiladas and watched Stranger Things. Which by the way, I am officially hooked on. We started season 2 and I can’t seem to get enough. I desperately needed a new show. Gossip Girl’s great and all but I can only watch Chuck and Blair get back together so many times. I don’t even really like sci fi kind of shows but I am loving the story, quirky characters and Millie Bobby Brown is so strong! I love it! Do you guys watch Stranger Things?! I also watched a few football games with Jared this weekend. It’s not my favorite activity but he seriously loves it if I plop down on the couch with him and watch a game or two. He’s a simple man and if something so simple makes him so happy, why not?! I also realized that after this week it’s the SUPER BOWL! Soooooooooo sister has got to get all of her new Super Bowl content out like NOW! 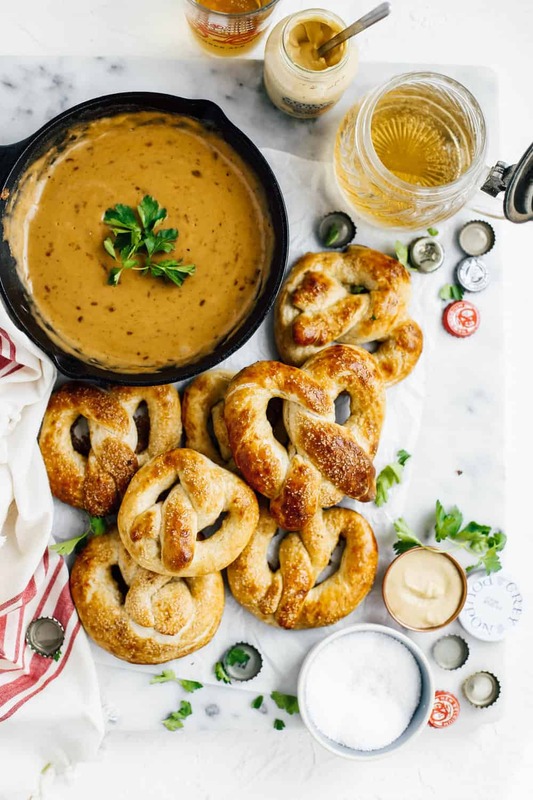 First up are these EPIC homemade hot pretzels with the gooiest, cheesiest, smoked gouda beer dip! I seriously had like negative amounts of self-control when it came to these hot pretzels. My whole house smelled like I lit a carb flavored candle in every room for HOURS. It was the best. They take a little bit of patience and an hour or two for the dough to do it’s thing, but they really are scrumptious. I am also going to take a strong bet that you already have everything in your pantry to make them! If you don’t normally buy kosher salt I would highly suggest to grab a box for these pretzels. You’re going to want that salty addicting crunch on top. 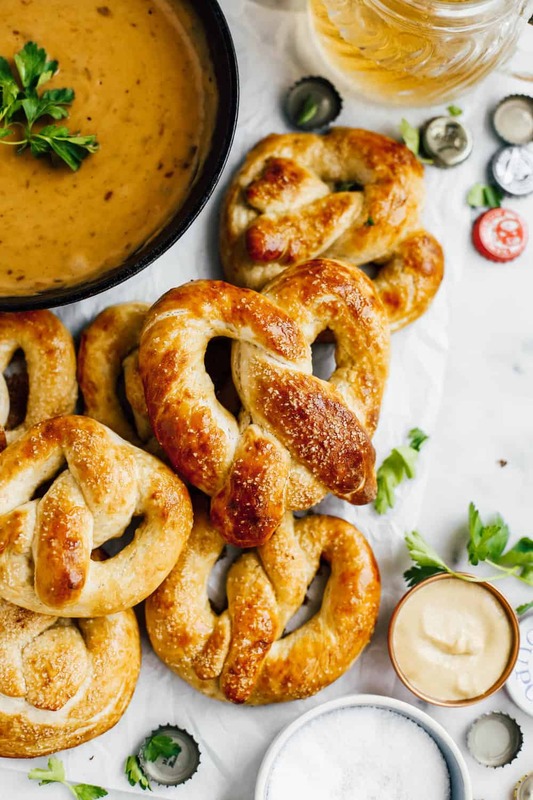 I followed along with King Arthur’s hot pretzel method because I’m not the best when it comes to sciency-yeasty-doughy concoctions and I wanted to make sure I had the right proportions for the recipe. I changed it up just a little bit for my own preference and of course, added an epic beer cheese sauce to dip them into. 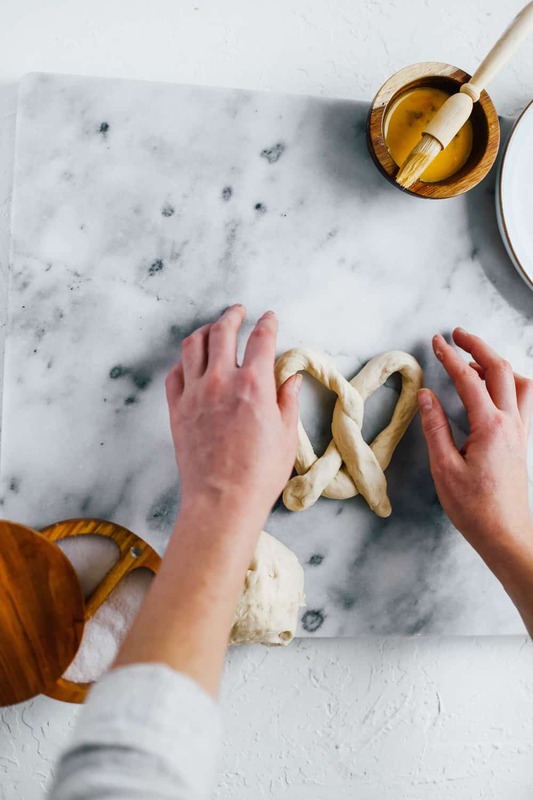 We made these pretzels a few times and I realized that the two best things you can do to make them feel ‘authentic’ is to add an egg wash before baking and a generous coat of melted butter on top after they come out of the oven! Believe me, I know it sounds sinful but you will seriously make Annie Ann herself wanting to take a bite of these. In a small bowl combine warm water and yeast and dissolve for 1-2 minutes. In a bowl fitted with a stand mixer and a dough hook (you can mix by hand if needed) add in flour, salt, melted butter, sugar and yeast mixture. Turn mixer on and knead for about five minutes or until the dough is smooth. 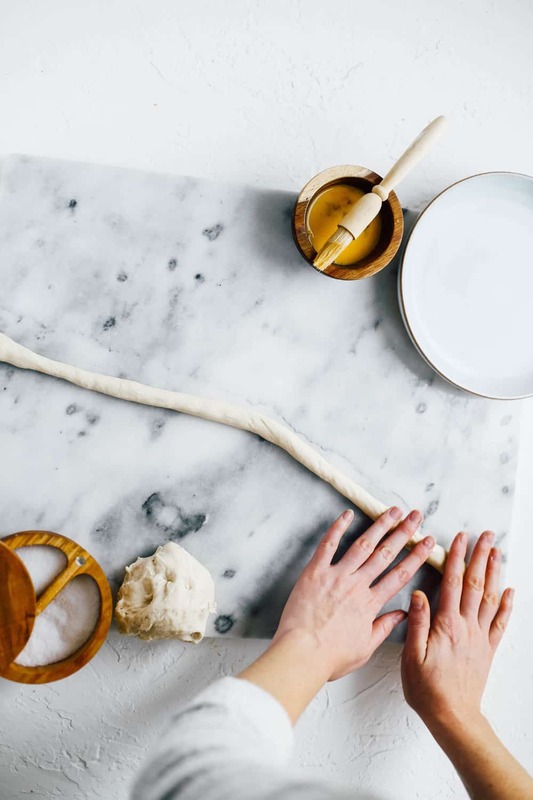 Place dough into a clean, dry bowl and cover with a kitchen towel or plastic wrap. 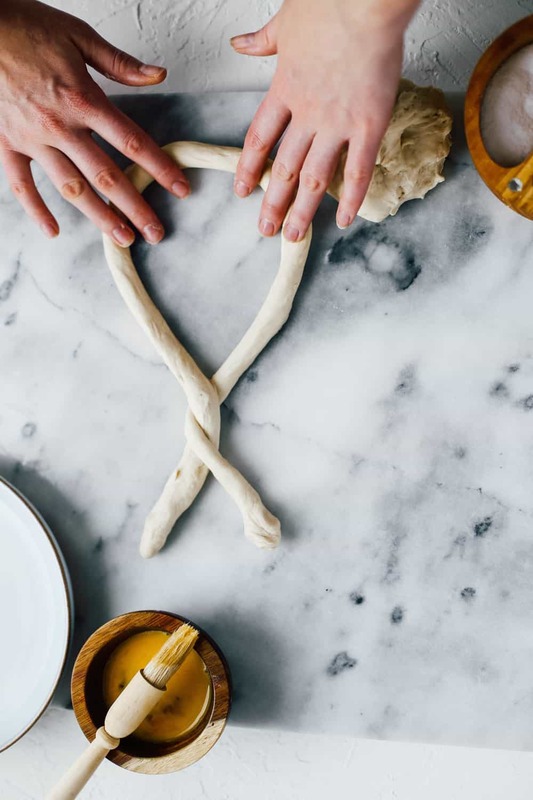 Place dough in to a dry place for 30-60 minutes or until the dough has doubled in size. While the dough is rising, combine boiling water and baking soda in a shallow bowl and whisk until baking soda is dissolved. Preheat oven to 475 degrees. Line a baking sheet with parchment paper and set aside. Punch dough down and divide into 8-10 equal pieces. 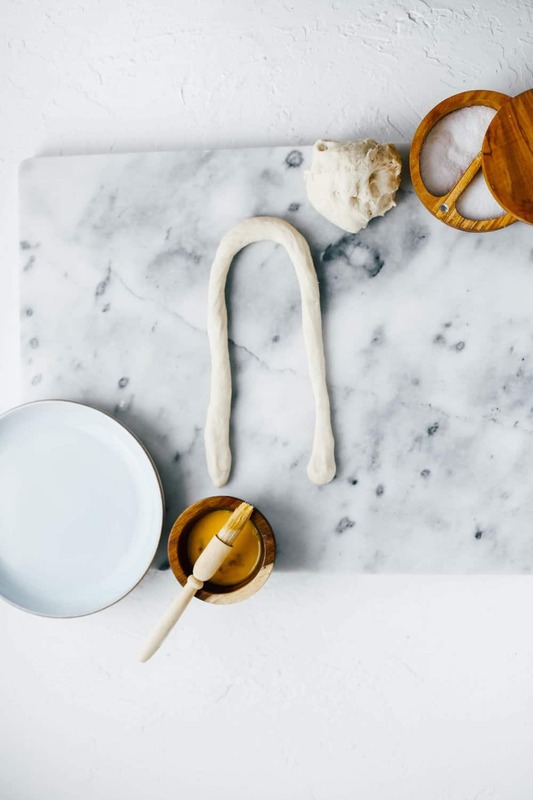 Roll each piece on a lightly oiled surface (spray lightly with non-stick spray) and roll dough pieces out into a long thin rope and shape into pretzel (see photos above in post). 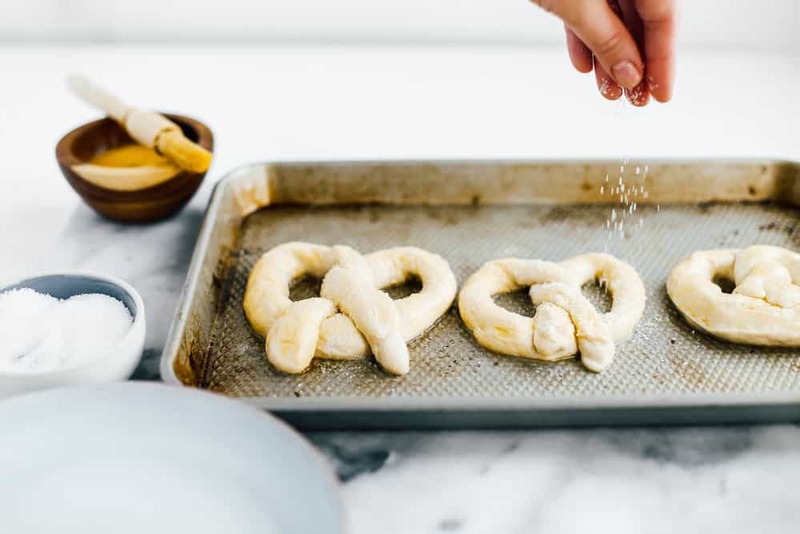 Dip each side of pretzel into baking soda water batch for 30 seconds. Transfer pretzel to parchment lined baking sheet and brush with egg wash and sprinkle generously with kosher salt. 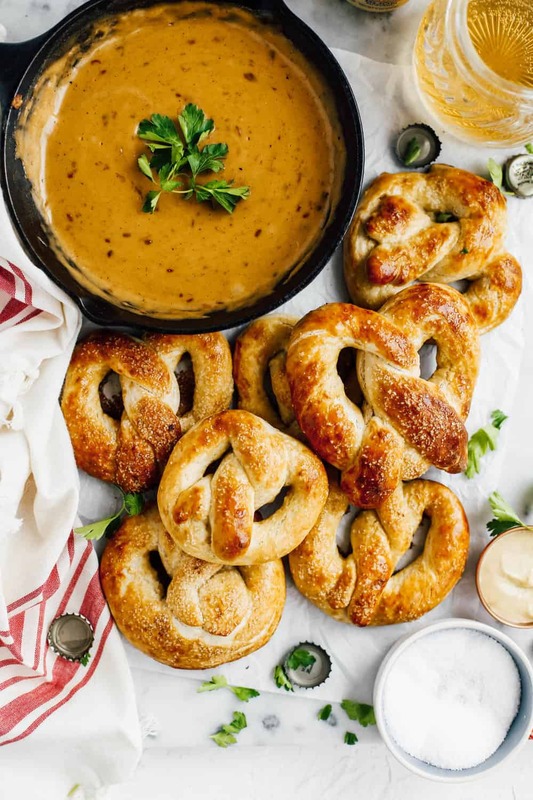 Allow pretzels to rest for 10 minutes and then bake for 8-10 minutes or until golden brown. 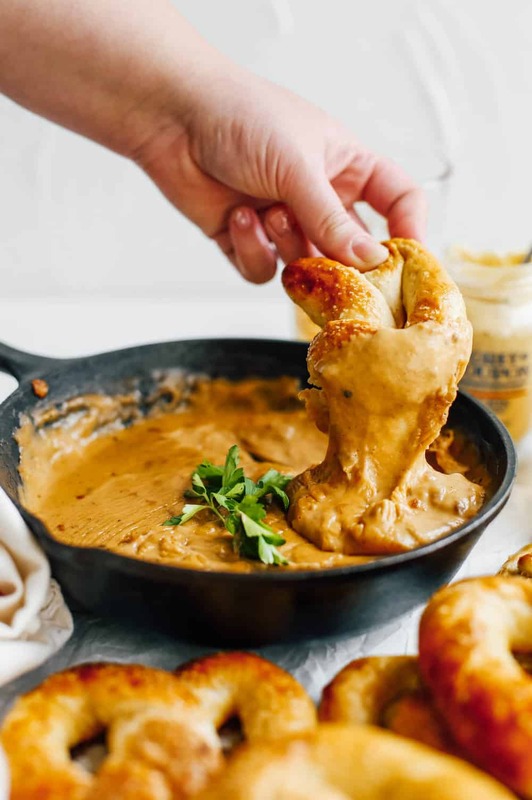 While pretzels are baking, prepare cheese sauce. In a small cast iron skillet heat on medium and add 1/2 stick of butter. When butter has melted whisk in flour. Cook flour mixture for 2-3 minutes, whisking consistently until browned and creamy. Add in beer, whisking consistently for 5-6 minutes or until mixture has thickened and slightly bubbling. Add in cheese in three increments, whisking after each addition has melted. Finish cheese sauce by adding in fresh minced garlic and cayenne pepper. this looks amazing!! 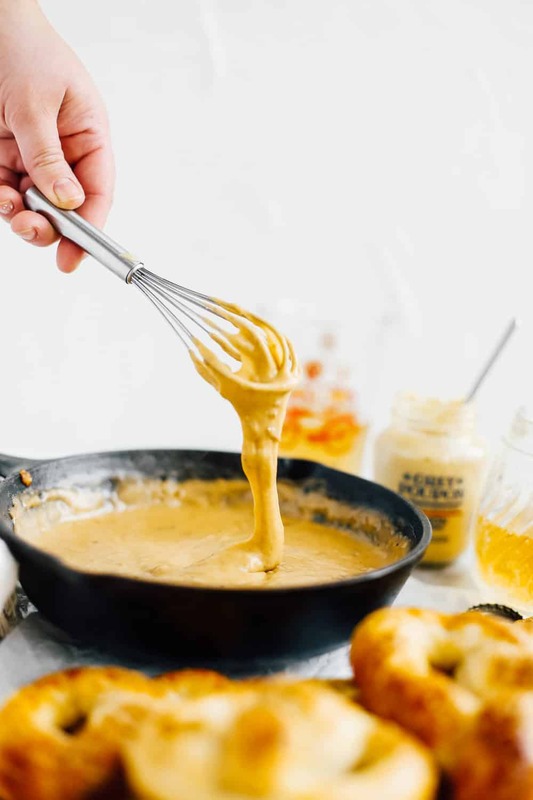 can the beer cheese dip be made the day before? Hi Maria! I don’t recommend making it the day before. If you do, reheat it on the stove and whisk in a few tablespoons of milk to try and bring the creaminess back to the queso.